(1) Not waiting until the last minute to pack. My clothes duffel is practically complete. I’ve picked through the large storage areas under the main bed and the bunks, getting rid of items not needed. Hitch up and ready to go. (2) Doing campsite research ahead of time and then being ready to make reservations when sites are first available. Camping at a national park campground is almost always preferable. The price is right and the location puts you near where you want to be. When making a campground reservation you need to know what sites can fit your RV (the smaller the RV, the more sites that are available). Using Google Maps for a bit of reconnaissance helps me take the campground map and figure out which site will work best. Come reservation time, you need to be ready. Most national park’s book their campsites 6 months out… to the day. Usually the reservation window opens at 10am eastern and if you want that dream campsite on the North Rim of the Grand Canyon, then you need to click the book button at exactly 10am. (3) I took a course in how to offroad using my 4 wheel drive. I have an offroad capable vehicle but have been hesitant to go on the national park’s 4×4 roads because of my lack of knowledge. A few weeks back, Sarah and I headed to a offroad park for a 4×4 101 class. I was able to learn about all the capabilities of my vehicle as well as my limitations as a driver. I was amazed at the terrain that my vehicle could handle and feel much more confident in adventuring on 4×4 roads in the national parks. (4) Pre-execution checks. Maintenance at the RV dealership where I purchased my travel trailer is becoming problematic. They have proved themselves untrustworthy with their ability to do basic tasks, despite my willingness to pay for it. I have to start doing most the maintenance myself. 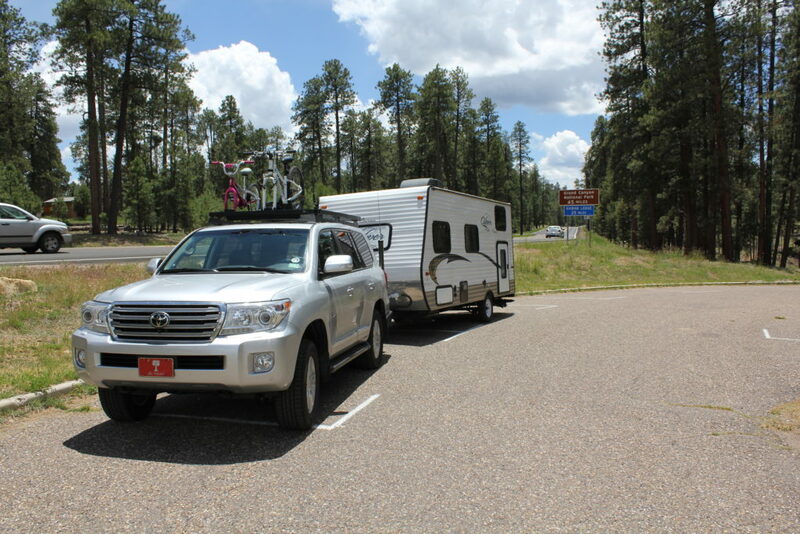 Before the big trip, I was able to take the trailer on a few weekend camping trips to make sure everything is working. (5) Less books. I read all the time. On past trips, I’ve packed a milk crate worth of hardcover books. Piles of guide books had surround my bed. Christa said, “Why don’t you use your Kindle?” Besides the fact that I prefer the advantages of a hardcover book (no power required, easy to bookmark, highly portable). Well, I’m going Kindle for this summer. That should easily save about 25lbs of weight and space. (6) Bluetooth adapter for travel trailer sound system. I saw a recommendations for a bluetooth adapter to connect an iPod to a trailer’s sound system. In the past I have used a simple patch cable. That was often a pain due to the case my iPod is in, it was hard to get the plug seated properly. Then I relied on a playlist shuffle and preset volume to carry the day. Now with the bluetooth adapter I can keep the iPod with me and adjust what is playing on the fly. The only downside is the battery life of the bluetooth adapter. When it runs out of juice, your done. (7) Practice cooking. Easily one of my biggest summer trip failings is my inability to throw together decent dinners. Usually it will not take much to convince me to make dinner plans at the national park’s dining concessions. I consistently underestimate the time involved in dinner meal preparation. Therefore, I have been trying to practice cooking some basic dinner meals that I will be able to reproduce while at the campsite. Devils Tower National Monument, Wyoming. Mount Rushmore National Memorial, South Dakota. 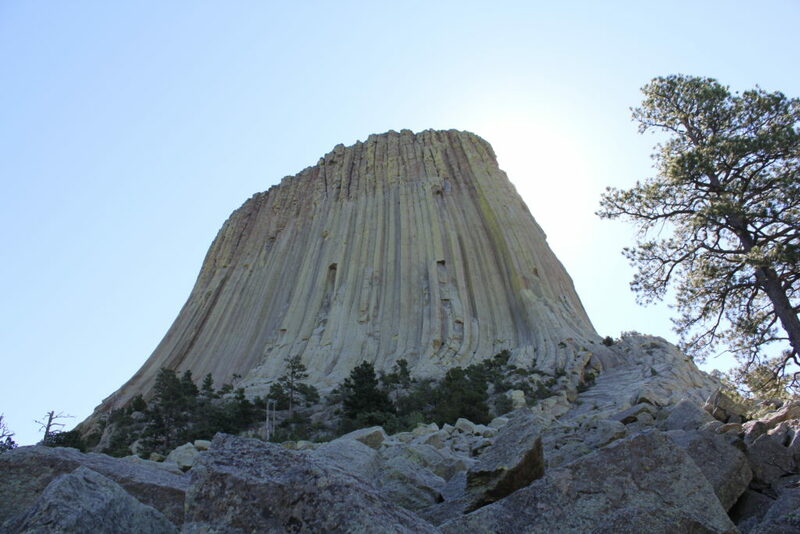 Sunday, July 24th – Left Devils Tower. Bits of rain. Easy drive on I-90. Stopped in Deadwood, South Dakota at Family Dollar for bread and ice. They had neither. 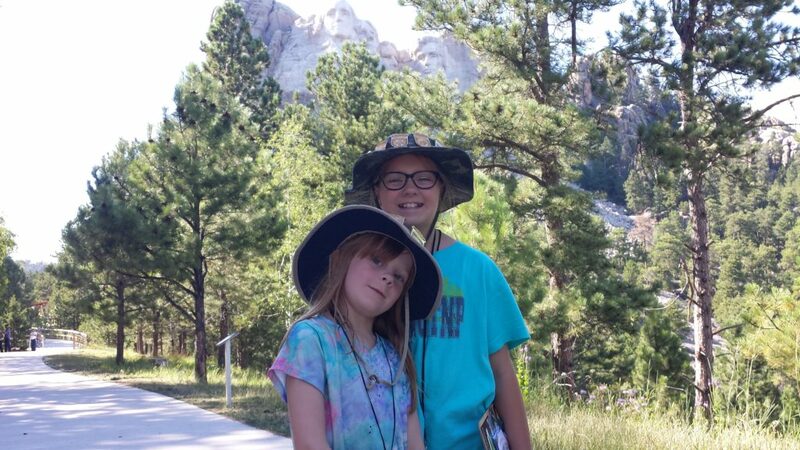 Arrived at the Mount Rushmore KOA – that place is like a circus. Dropped the trailer and headed to Mount Rushmore. Was able to squeeze in a 3pm and 3:30pm ranger program. Helped us understand why the memorial was built and how. The girls finished their Junior Ranger books. Final Junior Ranger Badges of the trip! It was pretty emotional for me to complete our last “park” of the trip. Did we find our park? Wind Cave National Park, South Dakota. Devils Tower National Monument, Wyoming. 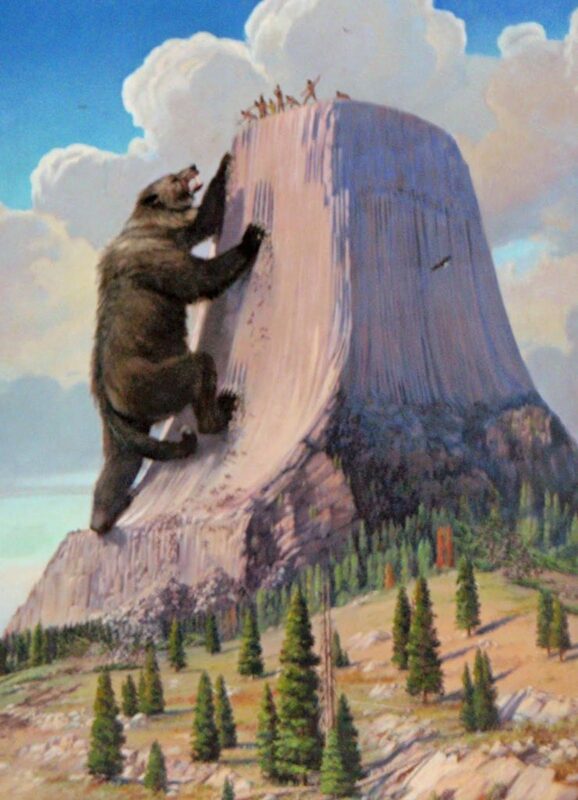 Lakota Native Americans call it the Bear Lodge. Friday, July 22nd – Toured Wind Cave. Once we entered the cave and started to descend, Emily was scared at first but then was ok. After the tour, the girls finished up their Junior Ranger books and received their badges for Wind Cave. The day started getting hot. The expectation was temps into the upper 90s. I had gotten a prime parking spot in front of the Wind Cave Visitors Center which allowed me to connect to their wifi. I used the wifi connection to make reservations at the Devils Tower KOA. The heat made me want to camp at a location where we could make use of our air conditioner. We left the Elk Mountain Campground around 1pm. Elk Mountain Campground is a good place to camp if the weather had been a bit more cooperative. I was disappointed in the lack of any substantial Ranger-led evening program. It was a nice drive in a northeast direction through a national forest to I-90 where we were only on I-90 to go up one exit. Checked into Devils Tower KOA (located immediately outside the monument) and had some food across the street at the trading post. Ended up getting a pull-thru site next to another ham (KF5SA). He has an HF station mounted inside his trailer. 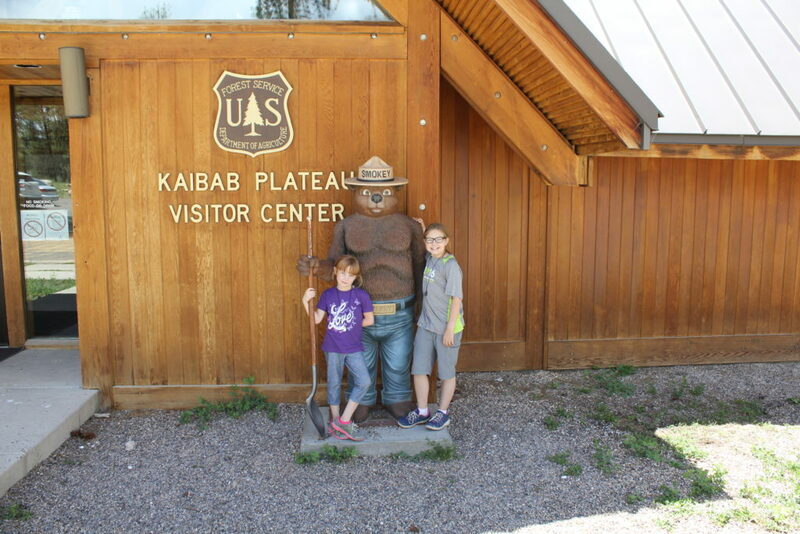 Quick trip up to the visitors center to get Junior Ranger books (from Ranger Erin Cahill). Attended evening program at the campground amphitheater which was blown out by bad weather into the picnic area. Friday, July 8th – Canyon Village, Yellowstone National Park. Day trip to Cody, Wyoming. We got on the road later than we should have. We took the road out of the east entrance to Yellowstone. I had never been on this road before. The east entrance appeared to be a good way to pull a travel trailer into the park, but probably not out. The trip was about 90 miles and took around two and half hours. The big attraction in Cody is the Buffalo Bill Center of the West. You can’t swing a dead cat west of the Missouri River without hitting something connected to Buffalo Bill. But the Buffalo Bill Center is the place to go to learn about ol’ Bill. We got here a too late to take advantage of everything there is to see. This is definitely on the list to return to see again. I honesty think you could spend two days seeing it all. Monday, June 13th – Travel between Zion and North Rim. Only you can prevent forest fires. Only you. We stopped to reprovision at Honey’s Marketplace in Kanab, UT. Great, full-service grocery store. Probably the best place to buy groceries in the area. Saturday, June 11th – Zion National Park, Utah. 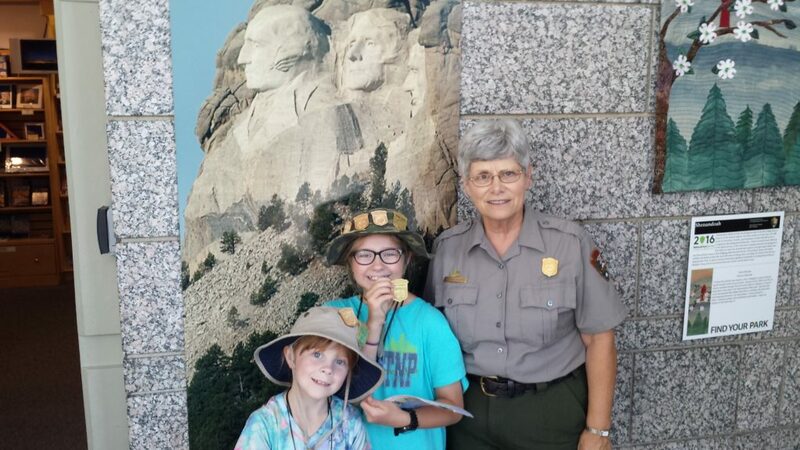 Ranger interpretative tour with Ranger Grace Lily. 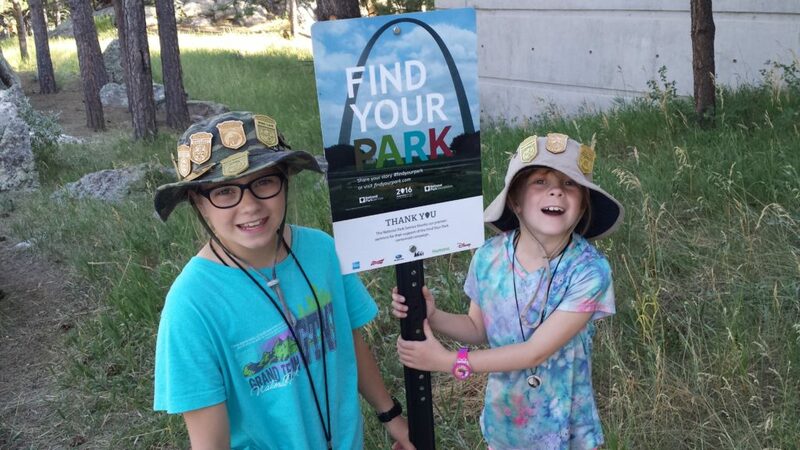 Sarah and Emily finished and received their Zion Junior Ranger badges. Interesting couple from Tennessee occupied the site adjacent to ours. The girls and I rode our bikes to the Zion Nature Center. Attempted to ride back towards the museum but went the wrong way and ended up at the Visitors Center. Line for the shuttle was LONG. I promised the girls ice cream at the lodge. Instead I ask Christa if she wants to go back to the Bumblebee restaurant/gift shop to get ice cream. We depart the park around 2:30pm and the line to get in extends well into Springdale. The streets are packed with parked cars of people in the park. We get ice cream. I decide to start driving towards Rockville and maybe Hurricane. A huge storm comes in with lots of lightning and huge rain fall. I decide to head to Cedar Breaks National Monument. I have no idea what Cedar Breaks National Monument is. I just know that the it is a National Monument run by the Park Service and that the GPS says it is about 30 miles away. Off we go north on I-15. I see a sign to turn off for Cedar Breaks at exit 57. The GPS says that I want exit 59. I follow the GPS and it takes me to a location that is not the Cedar Breaks National Monument. Back on I-15 heading south. I forget what exit it says to get off on and there is no southbound sign saying exit 57 for Cedar Breaks. Christa deploys her cellphone GPS. I have to go a further 3 miles down to get an exit and turn around once again on I-15. Christa’s cellphone says Cedar Breaks National Monument is another 30 miles away. I look at my gas gauge and it is in between 1/4 and 1/8 of a tank (3/16 of a tank?). Gas is relatively cheap in Cedar Pass (the major town off of I-15). I decide to wait for gas on the way back from Cedar Breaks. Ends up the route up to Cedar Breaks (Utah Hwy 14) is your standard two lane, narrow, steep mountain road. The Cedar Breaks National Monument is up at over 10,000 feet in elevation. As soon as I pulled in to the parking lot the fuel light came on! Cedar Breaks National Monument is like Bryce Canyon on steroids. A huge, massive amphitheater of rock. 2000 feet drop. Beautiful. Cold too…. snow still on the ground. As the ride back down was downhill, I made it to a gas station without running out of gas (although I was sweating it). Dinner at IHOP. Easy drive back to camp. Hopefully going to a Ranger amphitheater program tonight. Friday, June 10th – Bryce Canyon trip. We packed quite a bit into a small period of time. Left at 8am (wanted to leave at 6am). The route goes through the Zion Tunnel. Twisty, curvy the first 13 miles. Beautiful scenery. Arrive at Bryce Canyon. Park at the Visitors Center (not full yet). Get the Junior Ranger handbooks. Take the park shuttle to Sunset Point to hike the Queens Garden Trail. Slow going down 0.8 miles as it was steep. Had an excellent snack break down at the trail’s end under the shade of a large rock. The sun was beating on us during the steep accent back up. That trail really winded us. Took the shuttle bus back to the Visitors Center. Ate our picnic lunch. The girls continued to finish their handbooks. Toured the Visitors Center and saw the movie about the park. Picked up another shuttle to Sunrise Point for a geology talk by Joel (Geology Joel) Allen. The talk was excellent and was almost an interpretative dance describing how Bryce Canyon was formed. Back on the shuttle to the Visitors Center. Requirements complete for Junior Ranger, Sarah and Emily receive their badges. We then take the station wagon to the General Store and make use of their pay showers. Afterwards I am able to complete one HF contact. We then drive out to Rainbow Point, the furthest point out. We complete our snacks as it is getting late in the day now and I want to get back before we run out of sunshine. The drive back is nice and we stop at the Thunderbird Diner in Mount Carmel Junction for dinner. We wind our way back through the tunnel and down the mountain into Zion. 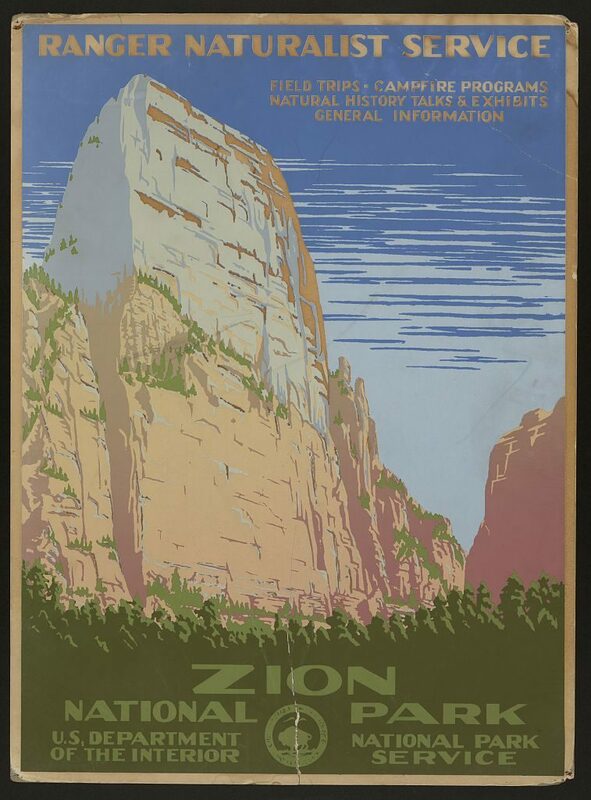 Thursday, June 9th – First full day at Zion. The time change threw our wake up times off a bit. Instead of awaking at 6:00am, we awoke at 7:00am. That is a late start for Zion. We were at the Visitors Center ready to grab a shuttle a bit before 9am and the lines to board shuttles were already quite long. Fortunately Zion does a great job with the shuttles. The lines were maneuvered quickly on to departing shuttles and before we knew it, we were off to Stop 7, the Weeping Rock. Wednesday, June 8th – Refit and reprovision. My concern for the axle seal and bearings on the driver’s side of the trailer had continued to grow since our time at the Meteor Crater RV Park in Arizona. Why was there grease coming from the end of the axle seal onto the tire rim? Why was it continuing? At fuel stops I would physically feel the axle temperature and compare it with the other side. There was no difference in the temperature. I was still worried. There was a van parked in the KOA that said 24/7 RV maintenance done on site. I called the number and an hour later I had a mechanic verify what was the best case scenario: excess grease from when the bearings had been repacked was making its way onto the tire rim. Although the house call was expensive, the peace of mind was worth it. We got our laundry done at the KOA (it is good to change in a few $20s for rolls of quarters before the trip), Christa got the shopping done at the Walmart (across the street from the KOA), and I was able to swap out our propane tank. Here is my note about propane. Last year I had two 20 gallon canisters with me. One hooked up to the trailer system and one carried in the bed of the truck. This year features no truck bed. I thought about carrying an extra canister in the back of the trailer (peace of mind with a spare canister of propane). Last year I only had to change out the canister once. The trailer really doesn’t use much propane. I decided to only go with one canister and no spare. The downside is that I have to swap out canisters even if I am not out. I guess in the end it is worth a bit of extra money to not have to lug a spare canister around. Tuesday, June 7th – Departure from Yosemite went pretty well. Although when I went across the street to the dump station at Upper Pines Campground, I forgot that my drain is on the driver’s side and had to drive through a second time to get lined up properly. The drive out of Yosemite on CA 140 was pleasantly uneventful, as I took my time. The Chevron in Merced (just prior to CA 99) has the nicest bathrooms we have ever seen! CA 99 from Merced to Bakersfield was better than I-5 (note to self – always take CA 99). A good portion of it was three lanes. My jaunt over the Tehachapi Pass seemed a lot less white knuckle going east bound than the west bound trip. Staggering heat awaited us on the east side. Temperatures soared above 100F as we passed Edwards Air Force Base, through Barstow, and on to I-15. The station wagon continued to be a solid performer with the temperature gauge steady. We passed the turn off for Death Valley and the temperature was 110F. Christa got a heat advisory message on her cell phone. That sounds about right. At last we pulled into Las Vegas, our GPS guiding us down past the major casinos. Pulling a trailer through the middle of Las Vegas was not my idea of a good time. We made it to the KOA campground. I assumed that the campground would be on the outskirts of Las Vegas, covered in desert dust. Nope. It adjoined a full-blown casino. And that is where we had a fine dinner at the TGIF inside the casino (that gave a 20% military discount – unbelievable!). A shower before bed… hadn’t seen a shower in a while.